Blood Soup and grilled cheese was our go-to Halloween dinner growing up. I'm taking it a step further by adding Mummy Dogs! Quick, easy, and something everyone in the family will love for a fun and spooky dinner before Trick or Treating! My parents always made us "blood soup" and grilled cheese for Halloween growing up. And then I got married, and my husband does this weird ground beef and ketchup and mustard thing for Halloween. So we started doing that too. And then I became a food blogger and decided that all my food needs to be cute. Enter: the Graveyard Poke Cake (one of my favorite new traditions, because I love letting my daughter decorate it! ), eyeballs in the soup, and mummy dogs! Even with the new additions to our menu, this is still a tremendously easy meal to throw together on any weeknight, but especially as you're rushing out the door for Halloween fun! You could, of course, always used canned tomato soup. That's what we did growing up. 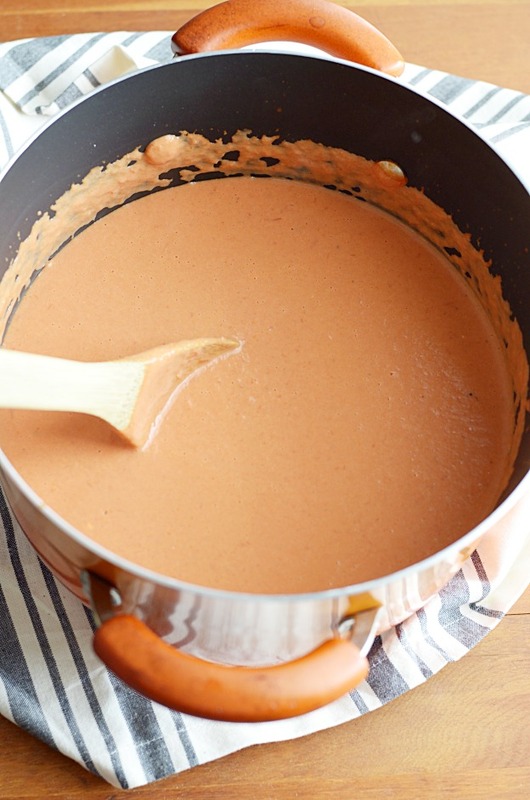 But just for kicks and giggles, and because this is a recipe blog, I'm including a recipe for my favorite homemade creamy tomato soup. Whether you go the homemade route or not, the most important part of the meal is the EYEBALLS!! Be sure to pick some up at Target or Walmart or your local craft store. I've found candy eyes at all of these stores around Halloween. Sometimes they're in the seasonal section or the baking aisle or the craft section. You just have to scope your store out! And I always stock up-- you never know how often candy eyeballs come in handy as a parent! The mummy hot dogs are simply refrigerated crescent roll dough cut into strips and wrapped around a hot dog like so. I won't include a recipe for that (just follow the instructions on the crescent packaging for baking). But I will say that we LOVE Nathan's hot dogs for these. They have the best flavor! For the finishing touch, use a little ketchup to "glue" on the eyeballs. And voila! 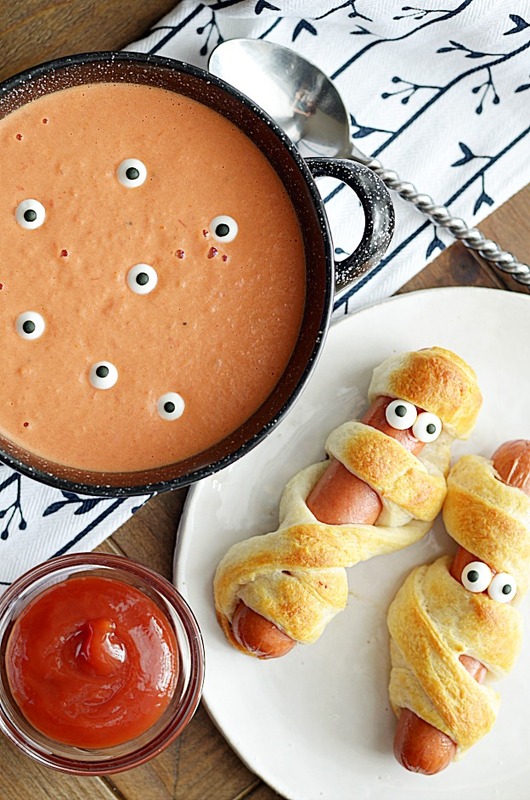 A halloween dinner masterpiece that your kids will love. Melt butter in a medium pot over medium heat. Sautee onion and garlic, stirring, until soft and translucent, about 3 minutes. Add tomatoes (undrained) and broth. Season with salt and pepper and bring to a boil, then reduce heat and simmer 10 minutes. Working in batches, transfer tomato mixture to a blender or use an immersion blender directly in the pot. Puree tomato mixture. Return soup to a clean pot and set over low heat. Whisk in cream and season with salt and pepper.